The Buffalo Riva is a classically themed American style pool table in a rich mahogany with traditional webbed leather drop pockets and column legs. The Buffalo Riva not only looks amazing but combines it's elegance with practicality - a concealed drawer in the table can be used to store your cues, balls and other accessories. This is a traditionally styled table with a durable, heavy duty frame, precision slate playing surface and elegant, carved, column legs and leather webbed pockets. The Buffalo Riva can be fitted with an American Atlas speed cloth available in: Green, Black, Blue, Purple, Burgundy and red. Atlas cloth is an American speed cloth, designed to increase ball speed and accuracy during game play. When choosing your pool table it is important to consider the size of the site or room you would like it to be in. It is recommended that there is enough room to fully extend a pool cue from the edge of the table to the wall. 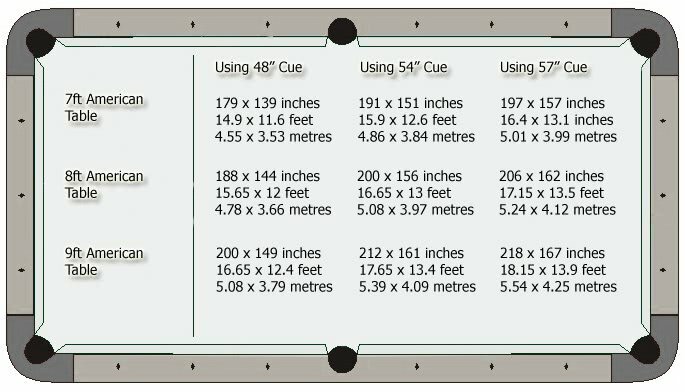 The dimensions below are an ideal size, however if space is a bit tight why not purchase a small cue for use with tricky shots.